Anansi and John Crow had a ball one night, so dey fin' dinner de night fe all de dancer. John Crow a great 'tepper, can 'tep better'n Anansi. So as Anansi fin' John Crow can dance neater dan him, he get bex. So after de dinner pop was hot, so he said to John Crow him mus' dance up to de pop. So jus' to get rid of John Crow de night, he got a ladle an' dash on John Crow wid de hot pop right up on de head, an' all John Crow head 'trip off. All de John Crow in dis worl' never have ne feder upon i' head heah; Anansi bu'n 'em off wid hot pop. In Jamaica, a turkey vulture is called a John-crow. In this story, John-Crow is the better dancer than Anansi, so the jealous spider poured some hot pop on his head...giving him a bald head forever. If Jamaica taught me anything, I learned how to give thanks. If you ask a Jamaican how they are doing, they may reply they are "giving tanks". Even if someone is having a bad day, they may say that they have been better but are giving thanks for life. I love this simple and daily gratitude for just waking up for another day, and it is a phrase and attitude that I will carry home with me to the States. To share the Thanksgiving holiday with my students, I strayed away from the history side of things and embraced this already familiar idea of giving thanks...with the addition of hand-turkeys! The kids loved tracing their hand-turkeys and had no problem filling their pages up with things that they are grateful for in their lives. Last year, I threw Friendsgiving at my house. This year, we stepped up our game and were able to hold it at my community member's bar about ten minutes away from me. It was a joyous time of homebrews, food, and good company. Cha Cha, a fellow volunteer, did a post on it, here! I did some face-painting this year at our school's Fun Day, which happened right before the December school term ended. Fun Days happen at least once a year in most communities and are a time for kids to enjoy themselves. There are toys to buy, rides to ride, and good food to eat. I never face-painted before but I got pretty good at butterflies and tigers...plus I do a mean Batman. I also attended my school's Christmas concert where every grade prepared a Christmas song or skit to perform. On Christmas Eve, George and I headed up north to meet Cha Cha, another friend and fellow volunteer. Cha Cha was planning to attend Grand Market that evening with her host mother, which is a Christmas Eve celebration in the more highly-populated towns of all night music, shopping, and food. They were kind enough to let us tag along so we could see the market madness in Brown's Town. We arrived to Cha Cha's house in the afternoon and were fortunate enough to have the time for her to show us her project at Discovery Bay Marine Lab...what a neat place! We met her cute little critter friends (pictured below), which I hope to help Cha Cha make into either a storybook or puppets (...or both?!) for environmental education purposes. Learn more about the marine lab in Cha Cha's own words, here. Like Friendsgiving, Christmas was spent in good company with some of my Peace Corps family, and ended with A Christmas Story. My Christmas can be summarized as a time of cupcakes, cookies, and cards. I was invited to come to a Christmas card-making night at my local church and brought along my pen and ink. Everyone was fond of the pen and ink effect on my card and before I knew it, I had a line of Jamaican women wanting me to decorate their card. 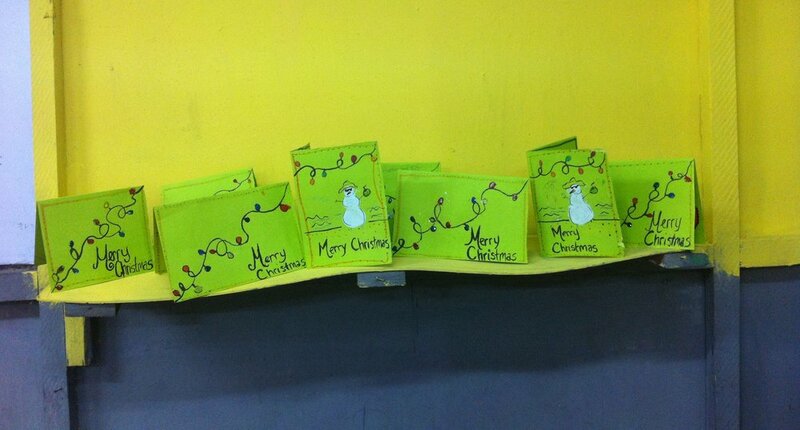 It was fun and inspired me to do more DIY Christmas card sessions with my students and the 4H Club. You may remember the painting I shared a few blog posts ago, and I decided I want to give it to my host-mother as a Christmas present. After all, I painted it of the view (the backyard) I only get to view because she was gracious enough to open her doors and host a Peace Corps volunteer. In American culture, you are expected to open your present in front of the gift-giver---we love to see the reaction of our loved one receiving the special item we made or picked out for them. In Jamaica, I have found it is more customary to put your present aside to open later, in private. I gave my host mother the gift at her dinner party, and she did the latter. I am eagerly waiting to see if she likes the painting! 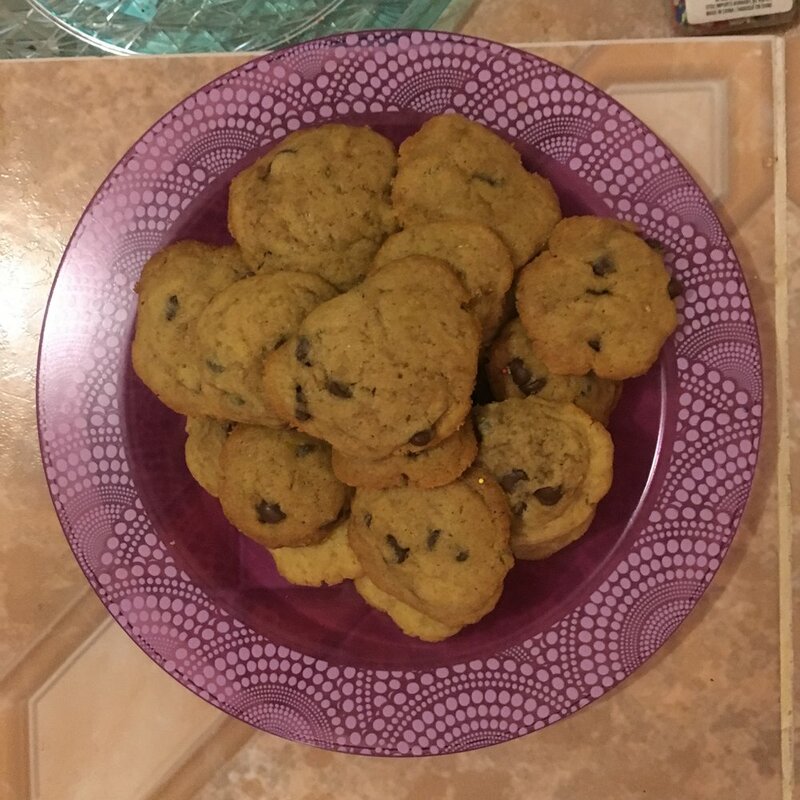 I also invited some Peace Corps Volunteer friends to come over and help my neighbors bake Christmas cookies, plus to make some cookies to bring to their communities! It was a delicious time for all and many cookies were baked (and eaten). !I have no images to show for two of my favorite parts of the holiday--One, George was taught by community members at a neighbor's party how to play dominoes and is now ready for a game anytime, anywhere. Two, my host-mom's nephew, that I met for the first time that night at her dinner party, revealed he was a music teacher. After eating, we grabbed our instruments and the night inevitably turned into jamming out on the veranda to Jamaican folk songs, Christmas carols, and even some Temptations as the night grew dark.